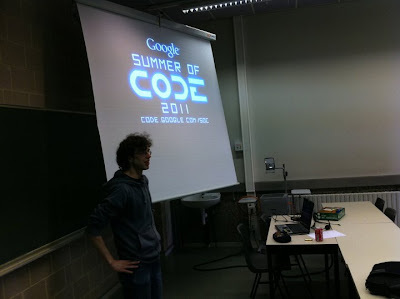 On the 6th of April, Google Summer of Code veterans Vincent Verhoeven (student for both KDE and Thousand Parsec) and Bram Luyten (mentor for DSpace) gave a presentation about the Google Summer of Code 2011 program to an audience of interested students. The Google Summer of Code schedule is quite challenging for Belgian students because of the large overlaps between the program and their examinations. However, the presenters made it clear that with careful planning in the application and transparent communication with mentors, successful participation is definitely possible. As an added bonus, if students are accepted in the Google Summer of Code program their participation can be counted as an internship for some of the master's programs at K.U. Leuven. The presenters were struck by the fact that of the 30+ attendees, none of them had any experience contributing to open source projects. Each of the students used open source software on a daily basis (Firefox, Linux, etc.) so it seemed like a natural progression for this generation of developers to start contributing to the open source community and Google Summer of Code is a great way for that introduction. Vincent's testimonial made it clear that participating in the Google Summer of Code can be just the start of a series of interesting experiences. Following up on his participation in the Google Summer of Code, Vincent and his buddies from the Thousand Parsac held a codesprint together at the GooglePlex. It's more than bits & bytes alone, it's about building relationships and friendships that last far beyond the span of one summer.